Transitions between two input clips by simulating a channel change on an old television set. The first clip goes black with bad reception, followed by the second clip with bad reception. The reception improves over time until only the second clip is left. Dissolve Amt: AutoTransition, Default: 0, Range: 0 to 1. The transition ratio between the From and To inputs. A value of 0 gives only the From input and a value of 1 gives only the To input. By default this parameter automatically animates from 0 to 1 to perform a complete transition. Reception: Default: 1.6, Range: 0 or greater. Master scale for all reception-oriented artifacts: static, interference, ghosting, horizontal and vertical hold, hum bars, and color stripes. Turn to zero to get perfect reception, i.e. zero of each of the above artifacts. Dead Time Style: Popup menu, Default: Static Over Black . Selects what the channel change should look like when there is no signal between the channels. Black: use black between the channels. Static Over Black: bad reception artifacts are displayed over black between the channels. Static Over Dissolve: the first channel dissolves into the second while reception artifacts are applied to both. Dead Time Length: Default: 0.2, Range: 0 to 1. The fraction of of the transition time to spend in between channels. Dead Time Start: Default: 0, Range: 0 to 1. The amount of time into the transition to start the channel change. Set this to zero if you want the first channel to go straight to dead air. Set this to one if you the second channel to snap in from dead air. If the parameter is greater than zero, the reception on the outgoing channel will get worse before going to dead air time. Conversely the new channel will get progressively better reception over time. Tv Pixels: Default: 720, Range: 1 or greater. The number of 'TV pixels' across the screen. Controls the size of the static, interference, scanlines, and dropouts. Lower this to simulate a lower resolution TV. Static Amplitude: Default: 0.8, Range: 0 or greater. Scales the brightness of the static noise. Scaled by Reception Master. The static dot size is controlled by the TV Pixels parameter. Static Density: Default: 0.7, Range: 0.01 to 1. Density of the static; turn up to get more static pixels; turn down to get only occasional static pixels. Interference Amp: Default: 0.6, Range: 0 or greater. Simulates interference from nearby electrical devices (electric motors, cordless phones, and so on). The look is a pattern of semi-regularly spaced random color dots. The dot size is controlled by the TV Pixels parameter. Scaled by Reception Master. Ghost Amplitude: Default: 0.6, Range: 0 or greater. 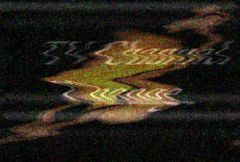 Ghosts are copies of the image that result from multipath distortion between the transmitter and the TV. Turn up this parameter to get stronger ghosts. Scaled by Reception Master. Seed: Default: 0.123, Range: 0 or greater. Horizontal Hold: Default: 0.5, Range: 0 or greater. Horizontal hold causes the image to shift horizontally in a semi-random way, simulating a TV with a bad horizontal hold circuit, or a signal not strong enough to engage the horizontal hold. Scaled by Reception. Vertical Hold: Default: 0.8, Range: 0 to 2. Vertical hold causes the image to shift vertically in a rolling motion. It's normally caused by a weak signal preventing the TV from locking on. This parameter controls the fraction of the time that the image is having hold problems. Set to zero for no vertical hold problems. Scaled by Reception. Bars Amp: Default: 0.3, Range: 0 or greater. Power line hum and other TV problems can cause rolling light and dark bars to crawl up the screen. This can also be caused by failure to synchronize a video camera to the TV output. This parameter controls the overall strength of these bars. There are two sets of bars, one large and one small, that mutually interfere. This parameter controls the overall brightness scale of the bars. Turn to zero for no bars. Scaled by Reception Master. Stripes Amp: Default: 0.2, Range: 0 or greater. Another common form of interference, color stripes are caused by phase shifts in the chroma signal, among other things. This parameter controls the overall brightness of the color stripes. Scaled by Reception Master. H Frequency: Default: 1.25, Range: 0 or greater. Vertical frequency of the horizontal-hold waves. H Time Vary: Default: 0.5, Range: 0 or greater. Modulates the horizontal-hold waves over time by this amount. When increased, some frames will have more horizontal shifting while other frames will have less. V Frequency: Default: 2, Range: 0 or greater. The frequency of vertical hold jumps. Decrease to get a more consistent rolling motion, or increase to get a jumpier look. V Speed: Default: 2, Range: any. The average speed of the vertical hold rolling motion over time. V Random: Default: 0.1, Range: 0 or greater. Controls how much randomness there is in the vertical hold rolling motion. Set to zero for smooth rolling, 1 or more for jittery behavior. Border Data: Default: 1, Range: 0 to 10. Brightness of the dots and lines that appear in the vertical blanking interval specified by Border Width. Int Frequency: Default: 1.28, Range: 0 to 500. Interference frequency. The look is very sensitive to this parameter. Fractional values like 0.3 or 1.23 look better than integers. Animating it very slightly, say from 1.27 to 1.3 gives a nice look. Dots Speed: Default: 1, Range: any. The dot pattern moves with this speed over time in X and Y.
Tint Lights: Default rgb: [1 1 1]. Scales the result by this color, thus tinting the lighter regions. Hue Shift: Default: 0, Range: any. Shift the color hues by this amount. Saturation: Default: 1, Range: any. Scales the color saturation. Increase for more intense colors. Set to 0 for monochrome. Scale Lights: Default: 1, Range: 0 or greater. Scales the result by this gray value. Increase for a brighter result. Offset Darks: Default: 0, Range: any. Adds this gray value to the darker regions of the result. This can be negative to increase contrast.